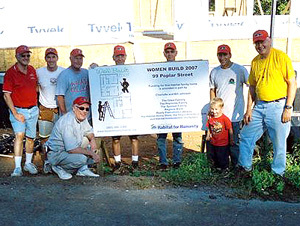 Nine Wabash men from the Knoxville area, including a Wabash dad, enjoyed our project at the Habitat for Humanity homes under construction. We were at nearby Loudon, Tennessee. We built and erected interior walls and did exterior painting at the other nearly completed home. These jobs were on houses to be "built by women." But, the women in charge agreed to let us do our Wabash thing and enter their turf for a day. Our guys did a great job, even finding and correcting a couple of previous construction mistakes. In Photos: Group shot: Frank Harris '64, and Brandon Butler; Back row: Jerry Blossom '66, Andrew Hecker '90, Steve Hildebrand '66, Tom Sailer '63, Fred Hecker, (Andrew's dad), Mike Butler '93 and Jim Rushton '67. 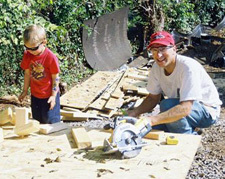 At bottom right: Brandon and Mike Butler '93 saw some lumber.